One of Apple's more interesting product announcements today was its Apple Battery Charger, designed to keep the company's increasing array of wireless peripheral devices powered up. While we briefly mentioned the release in our coverage of Apple's new Magic Trackpad that utilizes the rechargeable AA batteries Apple is now offering along with the charger, the batteries and charger themselves bear some closer examination. Apple touts that its new battery charger carries the industry's lowest "vampire draw", a measure of power consumed while not actively in use for its intended purpose. 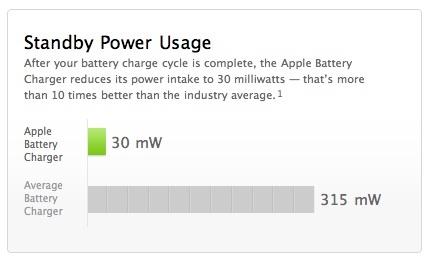 The Apple Battery Charger sets a new industry standard: It has the lowest standby power usage value - or "vampire draw" - of any similar charger on the market. That's the energy most chargers continue to draw after their batteries are fully charged. But the Apple Battery Charger senses when its batteries are done charging and automatically reduces the amount of power it needs. The company also points to the AA batteries themselves, which are designed to maintain a full charge through hundreds of charge cycles and last up to ten years. The batteries also maintain their charge while simply sitting in a drawer, retaining up to 80% of their charge after a year on the shelf. Six of the NiMH AA batteries are included with the charger. 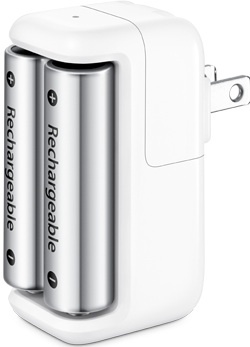 As is to be expected, the Apple Battery Charger offers traditional Apple styling, offering the same rounded white plastic design as other power devices from the company, while also utilizing the same removable plug with fold-up prongs to allow for interchanging adapter fittings. It's just like Apple to take something simple and make it even better. Way to go, Apple! I bought two and I am definitely not an :apple: fan boy. :cool:Steve 'Freaking God' Jobs. Slamming products on too market like we never seen.